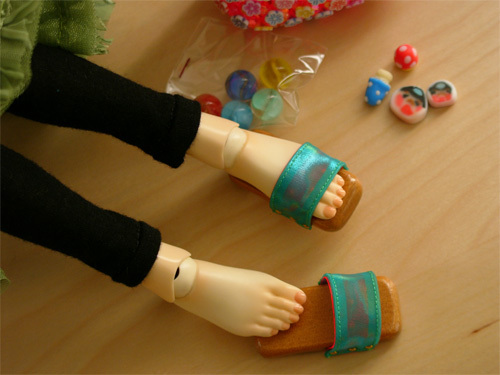 What company sold these mini sandals? Not necessarily that color - they may have been recolored by the owner. They look similar to some Leekeworld sold, but the ones in the photo are more rectangular and have smooth insoles. I know I saw these somewhere else once. Anyone know who sold them? They look like Mattel's Teen Trends to me...the skirt in the picture is definitely Teen Trends because I have that outfit! Sandals didn't come with the ensemble that featured that skirt though, but these look like the same shoe size. Hope this helps! Those are made by a Japanese seller/small company. They have a sqare wooden sole and a fairly straight material pegged on to go over the foot - the material is typically of some bright technicolour shade. You see them on YJ from time to time, often rather expensive. Thanks! I didn't think teen trends was correct because I have some of those. The maker is UbeeStore they make wonderful shoes and boots for Unoa and other sizes. They have a little online shop, if you check under the Unoa section there are several models around 4000yen each pair. I always wanted one pair of those sandals, maybe we can organize a group order? Yeah - I would like a pair. Maybe wait until everyone has payed for their Unoas. Yay, Flonne, I always wondered where I could get some! Did someone say group order? <pricks ears up> er...group order would be awesome! Can anyone translate that? I'd be up for several pairs of those wonderful shoes. It would be nice if we had a Japanese member who could buy all of them items we want and ship two group boxes, to one member in Europe and one in the US who could do the individual shipping. I would be up for a group order. If we can find a Japanese member to place it. There is a 2005 DoA post that says Ubees does not take international orders so you have to use a shopping service like Crescent-Shop. (or us having someone in Japan order them would also work).